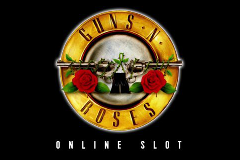 Get ready to rock and roll in one of the most anticipated online slot machines in history with the Guns N’ Roses slot machine – yet another licensed slot machine from Net Entertainment. Set at a concert outside with clouds on a blue sky, crowds of people ahead of you, and the band playing on a massive stage with lights and speakers surrounding them behind the reels, this slot is based on the legendary hard rock band Guns N’ Roses who have been performing since 1985. With Axl Rose and Slash featuring on the reels, the incredible design, the opportunity to choose one of their singles as the soundtrack, and a plethora of bonus features this is yet another number one for the legends! The ‘stage’ will be familiar to all of you who have played NetEnt slots before as it consists of 5 reels with 3 rows and a total of 20 paylines, though it is worth noting these are fixed and cannot be adjusted. The betting limits are friendly with coin values on offer range from just 1p up to £5 and this means you can play Guns N’ Roses from only 20p per spin up to a maximum of £100 per spin. Another aspect of the setup worth mentioning is the Set List. This provides you with the unique opportunity of selecting one of five soundtracks to play out as you spin the reels, with your options being some of their biggest hits - Welcome to the Jungle, Chinese Democracy, Sweet Child of Mine, November Rain and Paradise City. This is the first time I’ve come across this option but it certainly adds to the authenticity and fans amongst you will absolutely love it! As you’d expect the original band members dominate the reels with Axl Rose, Slash, Izzy Stradlin, Duff McKagan and Steven Adler featuring, plus there are album covers, the iconic Guns N’ Roses logo, and Ace to 10 playing card symbols that are mainly found in video poker machines, alongside bonus symbols to trigger the features including a vinyl record. The first of three features that occur completely at random during the base game, Legend Spins see you rewarded with 3 respins that are guaranteed to have stacked Wild reels. The first spin sees the third reel become stacked, the second spin sees the first and fifth reels become stacked, and the third spin sees the second and fourth reels become stacked – which always results in great wins! This sees an overlay Wild on the reels that forms the shape of a cross in three locations, and this can be displayed in full or partially. This can result in colossal wins if there are additional Wild symbols on the reels as well because there will be many winning combinations. The final feature that triggers completely at random is the Solo Multiplier which sees a multiplier randomly attached to a winning payline that contains at least three matching symbols however it doesn’t include Wilds – that would just be greedy. The multiplier values range from 4x to 10x which is incredible value and can see those small wins transformed to very large wins! The free spins mode in Guns N’ Roses sees you rewarded with 10 spins, and while you cannot retrigger more which is rather disappointing, there is an added reward to enhance your chances of winning. For each and every free spin one of the band member symbols appears in the reels as an overlay stacked Wild on one of the second, third or fourth reels – and that band members standard symbol is also Wild for the duration of the feature. The Crowd Pleaser bonus feature is a pick ‘em game that guarantees you wins and it consists of three levels. The first level sees you receive three picks, as does the second level which offers many free spin symbols (with three triggering the feature), and the third level is accessed if you win 300 coins or more from the first two levels – with your winnings doubled if you accumulate 800 coins or more. The Guns N’ Roses slot machine was one of the most hyped slots in recent history, and boy it doesn’t disappoint one bit. The design is sensational (set at one of their concerts) and the Slash stacked Wild is so realistic it feels like he is going to leap out of the screen. The biggest wins come from the Encore free spins feature and the Crowd Pleaser feature plus there is an instant win feature that sees you win between 10 and 30 times your total stake, not to mention there are three bonus features that trigger completely at random. All in all this is quite simply a jaw-dropping slot machine and I’d encourage you all to head to your favourite UK online casino to experience it now. If you’re a big fan of theirs this will be your new favourite online slot, and if you don’t like their music you’ll still turn into their biggest fan thanks to the monumental wins that are up for grabs!